Every texture, every component of this salad plays a roll to make it refreshing, and keep-going-for-next-bite-while-you-talk kinda delicious! well... you can stop talking, but you won't stop digging into this salad! I promise! I was hooked to this salad since I tasted it first-time in Boudin Bakery. Very refreshing! I did not speak a word while ushered in all salad in mouth and kept thinking - I'm copying it Boudin! Promise! But.... every-time, I came home and just got busy with something else. Then finally, when we visited Boudin last Saturday, I decided to make it this time. No excuses! You know we shop only once every fortnight. But, for this salad I requested Vishal to get me a packet of Spring Mix. That was the only thing I not had in hand. amazingly.... while testing recipe..... I kept going back to my thoughts and thinking.... Did I get it right? Am I missing an ingredient?! How can it be so so simple? 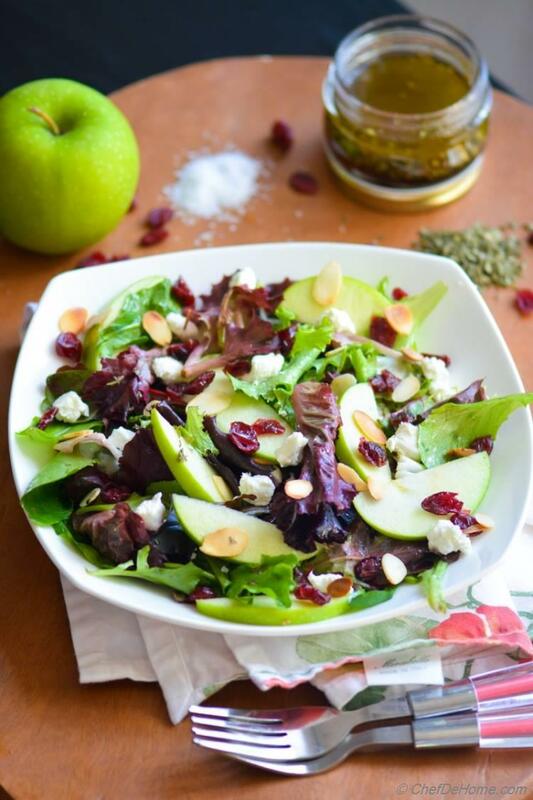 this salad is so simple yet packed with flavor! After clicking pictures.... when I finally sat down to ate this bowl of healthy heaven.... I was transported to Boudin.... along with living-room couch ;) This is the reason, I think this salad captivated me at first place. Just a few ingredients and bold flavor... + you taste everything! 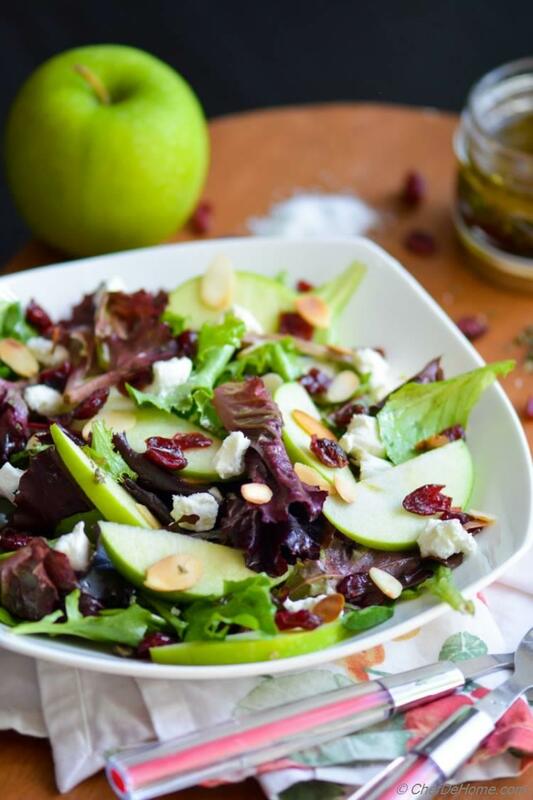 The nutty crunch of toasted almonds (don't use raw, recommended), fresh green mix, creamy goat cheese, tart crisp apple slices, and sweetness of cranberries. oh my my!! 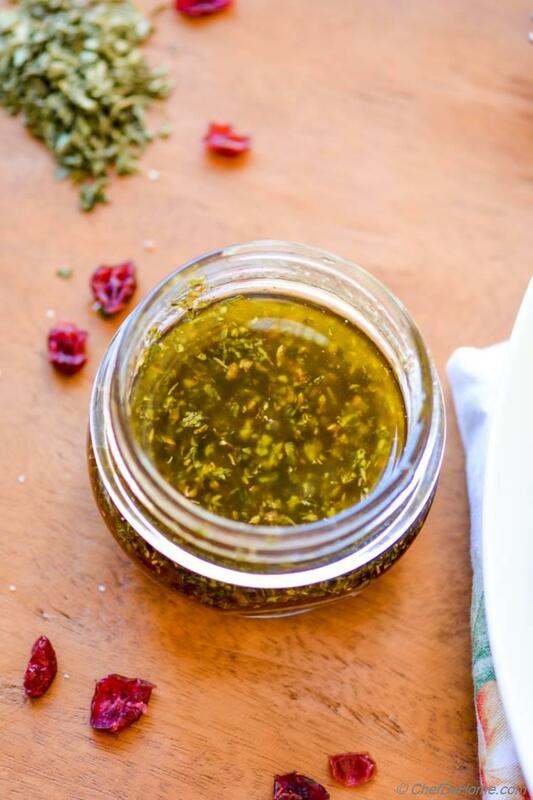 and not to forget, the flavor-bomb, easy-breezy White Balsamic Dressing! There is something about the mild-sweetness of white balsamic that will captivate you for rest of your life! And good part is, you don't need a lot of dressing this salad. Trust me! 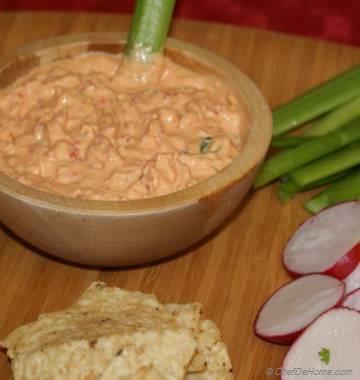 Two serving need only 1 tablespoon, yes your read correct, ONLY 1 tablespoon of dressing and the magic happens. Greens look more delicious, goat cheese become sweet and sour, almonds feel like.... umm.... ahhn.... hard to guess the right word! but you get it! right? Or if you don't, go try it once in Boudin! You will know what am I talking about! I would say, if this salad is wrong, I don't want to be right. (line stolen from Pioneer Woman Show, episode... don't remember!) what? we all are inspired from someone at some point of time! Aren't we? and Mrs. Ree aka Pioneer Woman can be a role model for any food blogger! Vegan! No friends, this salad is not vegan and I won't recommend skipping goat cheese either! Gluten Free! Oh yes! This salad is Gluten Free! Enjoy! Other than these, salad is also soy-free! All-in-all, really enjoyed copying this recipe. Playing with flavors, tasting and re-trying! lots of fun! trust me! And especially if end result is so satisfying then worth all the effort! 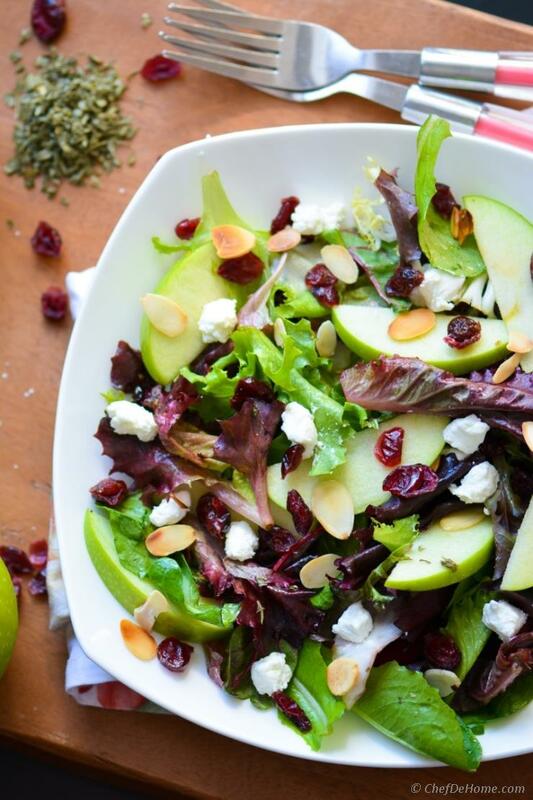 I'm so eating this Apple and Goat Cheese Salad, again, at-home! Cheers to Home Cooking and Cheers to such clean restaurant foods like this salad from Boudin Bakery! Total Time 12 minutes Prep Time 10 minutes Cook Time 2 minutes Difficulty Easy Yields 2 Salad Plates Serves 2 Notes 2-3 substantial or 4 small servings. 1. 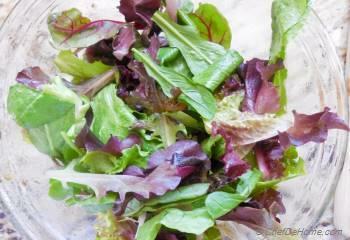 Dressing - Add all dressing ingredients in a wide salad bowl except olive oil. 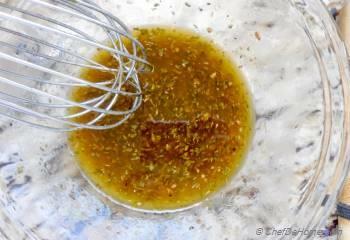 Whisking continuously, add olive oil to make a thick emulsion. Set Aside. Dressing is good for 4 servings of salad. So you will have half of dressing leftover at end of this recipe to make it one more time! I'm telling you, you will make it again! 2. 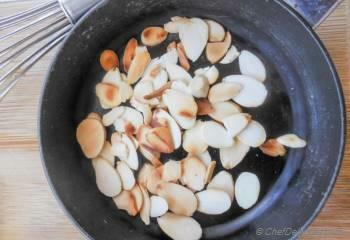 In a small pan, add sliced almonds. Keeping a close watch, toast until light brown. Immediately transfer to a plate of almonds tends to keep getting brown in hot pan. 3. Add 1 tablespoon dressing a salad bowl. Add greens and toss to coat in dressing. 4. Transfer to two serving plates. 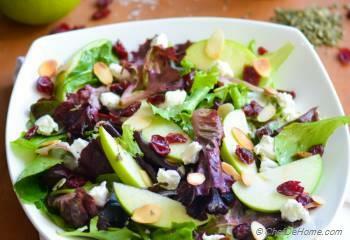 Top with apples, toasted almonds, cranberries, and dots of cold goat cheese! Serve and enjoy! Anu, thanks dear! indeed, the vibrant of this salad won my first time! thanks, Ami! 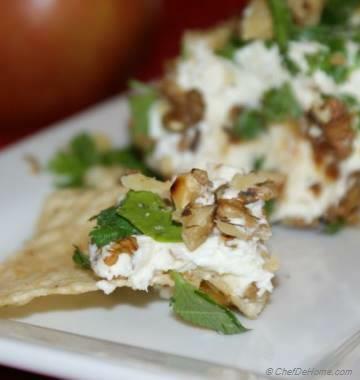 This proves we share similar palates :) apple and goat cheese, some tart, sweet and creamy, the perfect combo ever! Shubha, thank you! Yes indeed, this salad is simple and full of flavor! 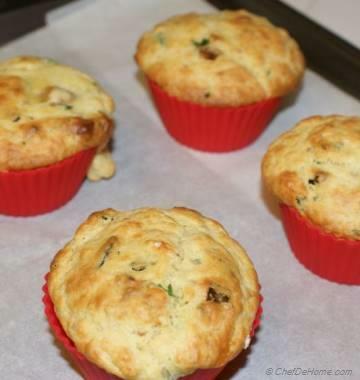 Simple , yet bursting with flavors, superb!! 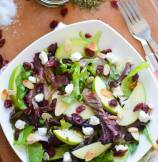 I'm always impressed and amazed with your salad recipes Savita! You are so creative, love this salad. I wish you were my neighbor, I would have come to your place for salad everyday, haha!